The World about 5 years from now. Countries/factions include Jesusland, the Nazis/terrorists, the (supposed to be) secret league of Drinking Buddies (for some reason it never managed to be kept secret),and the Chinese Empire. The world has been made from the chemical elements earth, wind and fire since forever. these elements have been seen (mostly by pot smoking hippies) occasionally coming together and playing songs that never end. The World is a very big place. Contrary to popular opinion, the earth has been scientifically proven to be in the shape of a very large cube, with the humans and other well known lifeforms living on the top, and aliens living on the bottom. It is difficult to imagine how big the earth is without some sort of comparison. It is roughly the size of 300 billion people lining up side by side against one wall of a room the size of the world, or to put it another way, roughly five times the size of a Russia. 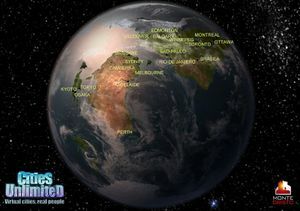 Many people have attempted to see what is beyond the edges of the earth. One such person is the retired comedian, David Williams, who tried to swim from Japan to the edge of the world. In his autobiography he described his life changing venture, "When I reached the edge, it was like nothing I ever experienced. A large wave carried me over 300 miles to the shores of Alaska. It was so unexpected." Scientists suggest that this is because of a large high speed conveyor belt, made completely from water, which loops across the whole world, and prevents the earth from running into the stars. Scientists also concluded from this situation that the earth is more of a cuboid shape, than a perfect cube. "It's not a cube, it's a rectangular cuboid. "|Harry Hill| on The World. 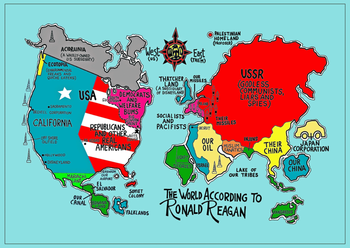 The World is made of Diddly Squat, Russia, China, The British Empire, USA , your mom and of course Romania. Belgium doesn't exist. Lithuania has been known to be in several different continents: Africa, Europe and sometimes in Asia. Finland and Portugal are not countries at all, they are mental disorders. The Netherlands is the capital of the UNIVERSE, but it will be almost completely destroyed by your mom in 2017 and after that the world will be ruled by glow-in-the-dark monkfish, whose seat of power will be Neasden. It is currently owned by a mobile group of crustaceans and sea urchins wearing human-like skin; these are usually collectively known as THE BORG. 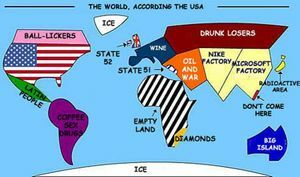 United States of America view on the world. +++China! pandas will fight off the fish and eventually guide the world to the Age of Bamboo. ++++IEEE 1394 To this day, the Kingdom of the Incredibly Evil Eternal Ebayers has not yet been discovered. The world is populated generally, primarily, and/or mainly by Super Humans, Master Humans, Fantastic Humans, Hairy humans that don't know anything (also known as Americans),GwarlingsForeigners, Monkeys and vikings. Also there is some secondary population, known mostly as "MINE" or "NOT YOURS!". There are over 7 billion people in the world, which has led to massive shortages of food. Cannibalism has been adopted in many places in order to both feed the important citizenry, and get rid of the unimportant people. As the unimportant people make up the vast majority of people on the planet, the select few important individuals are assured of stable supplies of food for years to come. This is a confusing subject. Don't even try to understand geography because everything you think you know about it is wrong. For example, what country was Poland once a part of? I bet you never knew that, did you? You forgot Poland! 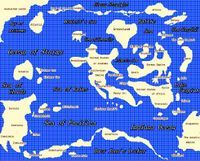 In the 1980's all maps in the west were drawn by Ronald Reagan, he discovered some land masses have moved slightly due to plate tectonics. Oh, and everything was owned by Svalbard during their Golden Age right after the sixties. The world is importing billions and billions of dollars worth of space debris and heat and light while exporting nothing except heat light and crappy American/Australian soap operas, promoting an unstable economy that will eventually collapse. When seen from god, our world makes up a pair of unequally hanging testicles. This page was last edited on 24 December 2013, at 04:11.